Donations will be used to cover tournament fees, program expenses, update equipment, soccer balls, new team jerseys, goals, nets, pinnies, and cones. Donations allow us to provide our young athletes with safe and reliable equipment, so they can compete to the best of their abilities. Helps purchase new nets for our playing fields. "From uncle Arnab & aunt Joanne. Love you Katelynn." "You Got This Carlie! kaniffe!! :)"
"Have a great season Los Osos! Have a great season Jasmine!" 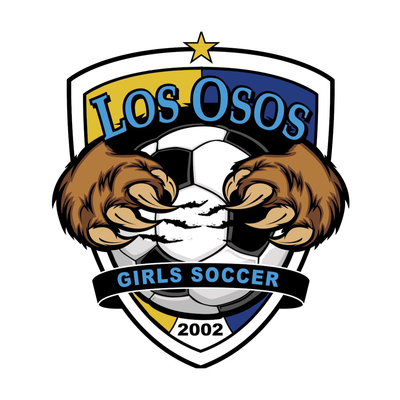 "Go get 'em Los Osos girl's soccer!" "Love , Opi & Honey"
"Have a great season Kylie!" "good luck Sky, hope all goes well with your team. say hi to mini shuchs , love Grampa"
"We love you so much Lauren Star. The entire family is so thrilled to see you back on the field doing what you absolutely love. Have an amazing year!" "Have a great year baby girl!! Love to see you play. " "Good luck Skyler on your soccer fund raiser! Grama Sharon"
"You go girl! We are so proud of you. Love, Grandma and Grandpa"
"Love you Ky-Ky!! Gooo Los Osos!!! " "Good luck, Devin on your Fundraiser! Love you." "So glad to be able to support the soccer team!!!" "We love you Skyler and are so proud of you! Aunt Ingrid, Uncle Steve, Spencer and Emily"
"Go Madison! Remember we love you and are always cheering for you! -Love Aunt Ligaya and Uncle Chris"
"Have a great season Devin! We love you, Aunt Tracy and Uncle Jason"
"Go Emms & Osos! xoxo"
"Here’s to a great season, Los Osos Girls Soccer!" "Madison, Ahma and I are so proud of you!!! We love you so much and are looking forward to a winning season for Los Osos girls soccer team!!!!! You are a winner already!!!!" "Way to go Madison! We are so proud of you and all of your accomplishments. Have fun and play hard. We love you so much and wish you the best season ever!" "Use to be at the Osos field with Ashie! Great memories there. Hope this helps Peyton"
"God bless, Sabrina, as you shine His light on and off the field! Love you and miss you and the fam!" "Kylie you always play so hard and a really good team player. Good luck to you & your team. " "Best of luck to the Los Osos Girls Soccer Team."